Lawerance Public Sen. Sec. 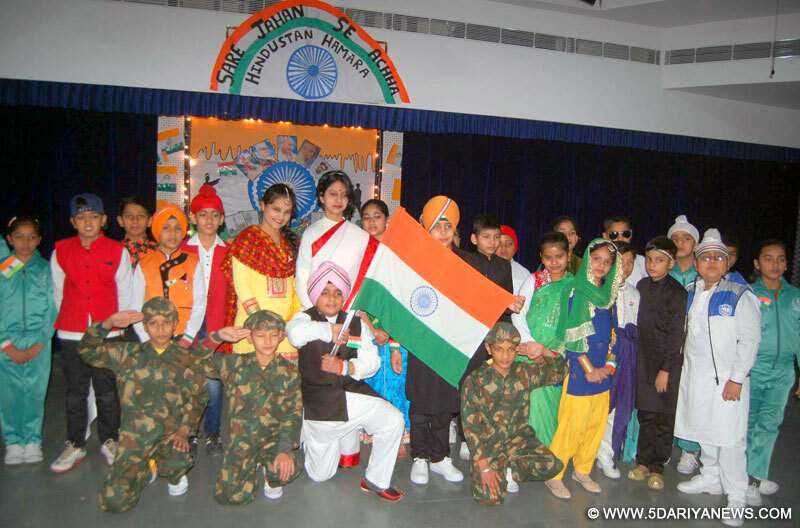 School, Sector 51 celebrated 67th Republic Day at its campus. The school auditorium echoed with patriotic fervour and enthusiasm. Besides songs and dances infusing the spirit of patriotism, plays on social vices like corruption and superstition were staged to create awareness. Skits on Rights and Duties and cleanliness drive were centre attraction of the show. Students attired in tricolour depicted love for motherland, the junior students brought the stage alive with their mesmerising tableaus and power packed performance.Later, taking the responsibility forward and as a part of cleanliness drive .Besides ,senior students also organised a rally to spread the message of Save Environment and Save Earth.Principal of the School Veena Malhotra Said that we, Indians can keep our national spirit alive by recalling the past to improve our present and future and she further added that we should be true Indians in words ,action and thoughts and be worthy of our country .